This lace always amazes me since it is entirely hand stitched. 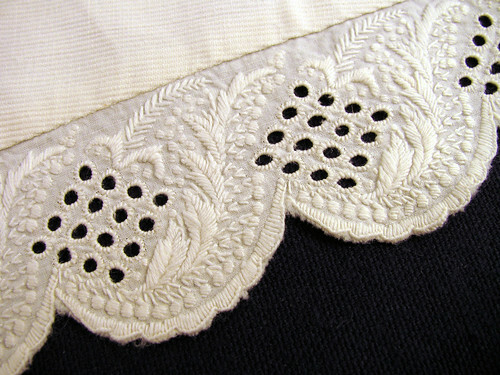 It is sewn to a late 19th century baby’s dress. I can tell that by the cut of the sleeves. The dress has a few lichen stains, but the lace is still spot free. There is about a yard of it in total around the hem. I love the design of diamonds and leaves. It is interesting how the scallops overlap. I wonder how long it it took to embroider, eyelet after eyelet, and leaf after leaf. 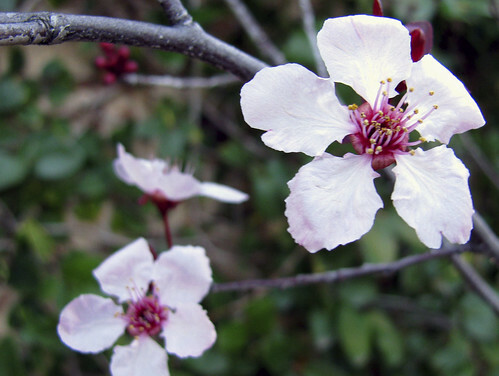 Here is a photo of our first plum blossoms of 2009. There are lots of buds waiting to open. I hope our early spring weather holds. This entry was posted on Saturday, March 7th, 2009 at 6:36 pm and is filed under Crochet, Embroidery, Lace and Sewing. Tagged: Embroidery, Garden, Lace, Sewing. You can feed this entry. You can leave a response, or trackback from your own site. The plum blossoms are gorgeous! I don’t recall ever seeing them before.